This waterfall is an impressive 200m high and will no doubt be a highlight of your trip! 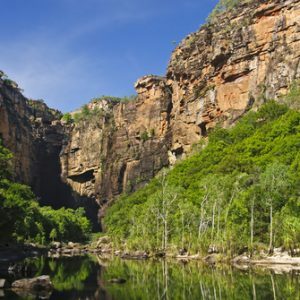 The turn off to Jim Jim Falls is located approximately 45kms south of the township of Jabiru along the Kakadu Highway. From here it is approximately another 50kms of unsealed corrugated gravel road to the Garnamarr Camping area. 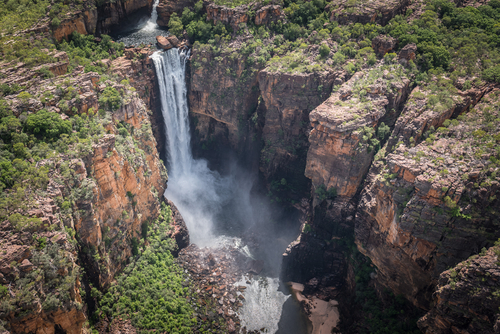 Jim Jim Falls is one of the more well-known waterfalls of Kakadu National Park and is an icon of the region. This waterfall is an impressive 200 m high and will no doubt be a highlight of your trip! 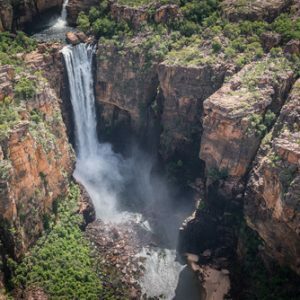 The turn off to Jim Jim Falls is located approximately 45 kilometres south of the township of Jabiru along the Kakadu Highway. From here it is approximately another 50 kilometres of unsealed corrugated gravel road to the Garnamarr Camping area. At this point only high clearance 4 wheel drive vehicles can continue. It is another 5 km drive along a narrow winding track which has several soft sandy patches and creek crossings. Jim Jim Creek crossing is usually between 400 mm and 600 mm however has been known to reach up to 800 mm! This crossing has a firm concrete base and a snorkel is highly recommended. Allow two hours one way and ensure you have a well-equipped 4 wheel drive vehicle and drive to the conditions. From the Jim Jim Falls Car Park clear signage will direct you to the Plunge Pool Walk (approximately 2 kilometre return). 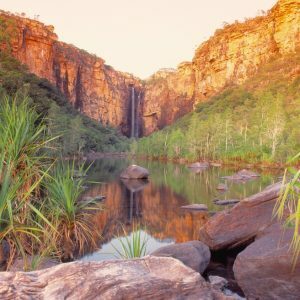 The initial part of this walk is an easy to moderate marked track, approximately 400 m, where you can enjoy a stunning view of Jim Jim falls from afar. Should you continue on in order to view the majestic waterhole up close, you will meander your way through monsoon forest along the Jim Jim Creek, to the deep waterfall plunge pool. 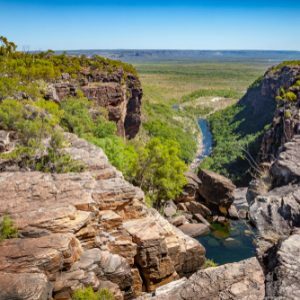 Don’t underestimate this walking track, the scenery is exquisite however the track involves scrambling over increasingly large boulders and is graded as moderately difficult by Kakadu National Park. Boulders can be sandy and slippery, supportive enclosed shoes are recommended! The closer you climb to the falls the more captivating they become. The dramatic escarpment walls will leave you in awe of Mother Nature. The plunge pool is very deep and at times shockingly cold! However there is a white sandy beach close by which gets a good dose of sunshine making it a slightly more comfortable bathing experience! 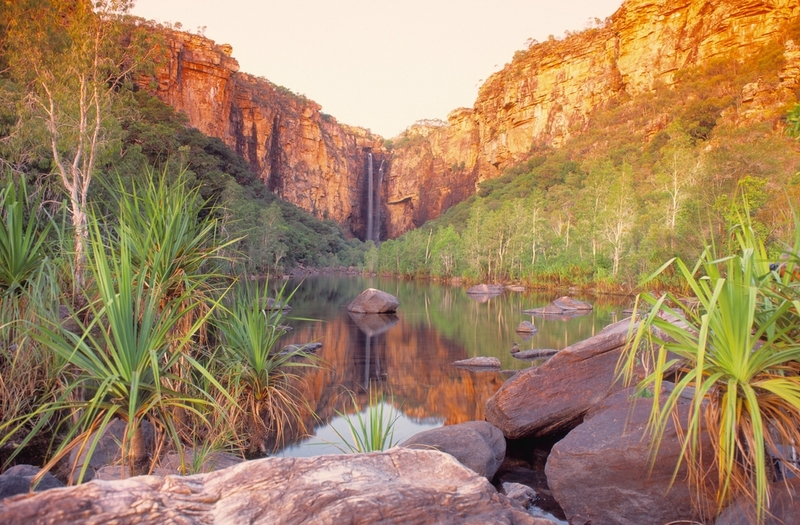 Kakadu National Park recommend to allow 3 hours (return) to complete. Depending on the time of year and the impact of the abundance of water the previous Wet Season delivered, as the Dry Season progresses late into the year, the Jim Jim Falls will gradually cease to flow. For the ambitious adventurer, with a high level of fitness, the Barrk Marlam Walk is for you! The rugged 3km ascent to the top of Jim Jim Falls will have you captivated by the spectacular view of the escarpment. 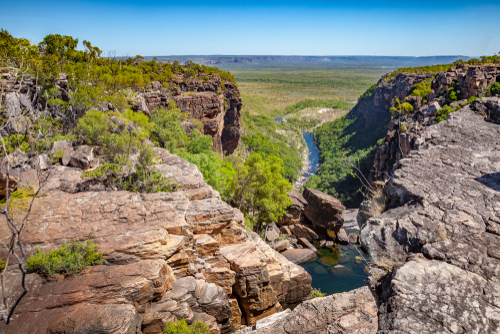 Kakadu National Park grade this walk as difficult, a steep climb along a marked track. It is recommended you carry at least 3 litres of water per person and keep the markers in sight. Depart prior to 10 am in order to minimise effects of the heat of the day. 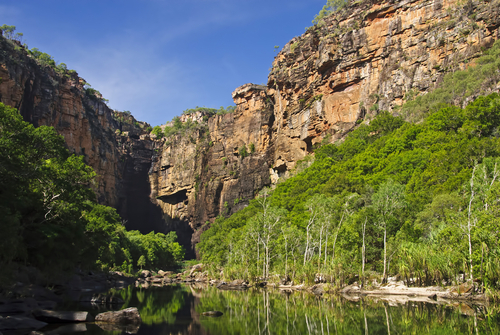 Distance: Turnoff to Jim Jim Falls is approximately 45 kilometres from Jabiru Township along the Kakadu Highway. It is a further 50km’s to Garnamarr Campground on unsealed at times highly corrugated road and an additional 5 kilometres high clearance 4 wheel drive vehicle only track to the Jim Jim Falls Car Park. Camping: Garnamarr Campground is open 6:30 am to 8:30 pm during the Dry Season. Facilities include hot showers, toilets, wood barbeques and picnic tables. No generators. Suitable for tents and off-road camper trailers. Fees: $10 per person, per night. Under 16 years free. No bookings. Seasonal Access: Dry Season access only, usually May to September. Check with Bowali Visitor Centre for road closures prior to visiting.